Come to our London Craftivists Garden workshop! Starting 7:30pm with a short introduction and then crafting in groups, this exciting collaborative venture will show how craft activities can help improve wellbeing by involving participants like me and you in the fun, connected, sensory and mindful process of making things. This is a unique project that goes beyond seeing craft as a relaxing tool but seeing craft as an incredible tool to help us connect, challenge ourselves and help us grow and flourish in our lives in different ways and help us see how we can change the world one stitch at a time. Join our London workshop to hand-embroider, knit or crochet a flower for our #wellMAKING Craftivists Garden, while reflecting on the importance of wellbeing and what we need in order to flourish as individuals and as a society. We want as many people here as possible. Please arrive just before 7:30pm to start at 7:30pm with a short talk and then crafting in groups around tables. £4 ticket pays for the craft resources. You can also buy tea and cake from the ethical cafe to have whilst crafting. Many of us have read about or experienced first hand how craft helps people’s wellbeing, and we believe it is also a beautiful tool for us to reflect on how we can improve the wellbeing of those around us in our communities and in society. Craft is a lovely way to keep us optimistic and striving for better things; it’s a great tool to think about challenging and sometime uncomfortable thoughts (like how we all impact each other and planet) with the comfort of craft to help us not go into despair or feel disempowered. We want each flower to represent you as a flourishing flower in our garden (which itself represents society, obvs!) and the time you have taken to deeply think about wellbeing for you and others. We’ve also created an app to collect your private answers to our questions for us to provide evidence of the power craft has to improve our society. And we’d love you to join our #wellMAKING Garden Party in January when it is confirmed. 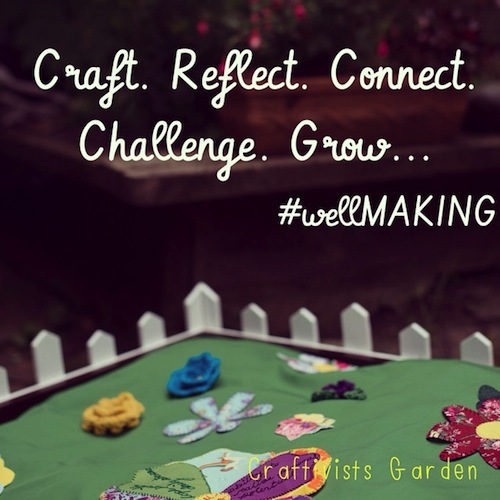 The #wellMAKING Craftivists Garden UK project is being run in partnership with Falmouth University, Voluntary Artsand Arts for Health Cornwall & Isles of Scilly, and is a Connected Communities project supported by the Arts and Humanities Research Council. So sad to have missed your event on 8th Oct-I’ve literally just discovered you on twitter a few days too late! Will you be holding any more events soon?